Celebrating the Dunbrody Famine Ship, the Irish Emigration History Centre, the Irish America Hall of Fame, and the upcoming inaugural Irish America Day, hosted by the town of New Ross, Co. Wexford. “Build it and they will come” may be a modified version of a line from baseball movie Field of Dreams, but it is also reminiscent of Noah and the Ark. In New Ross, Co. Wexford, an unemployment blackspot in the late 1980s, Noah was the volunteer group of local business people who banded together to try and save the town. New Ross is the ancestral home of President John F. Kennedy, and the efforts of this volunteer group resulted in the creation of the John F. Kennedy Trust to commemorate the Kennedy legacy. The plan was to develop a tourist attraction that would highlight the maritime history of the port and make something positive out of the negative aspects of emigration by focusing on the contribution that the Irish had made throughout the world, particularly in North America. Almost 25 years on, it is clear that the “build it and they will come” approach has had a positive effect on the town. New Ross now has its own ark in the form of the Dunbrody, a replica famine ship (an initiative of the JFK Trust), which has had one million visitors since it opened in 2001. In 2011 the National Emigration Centre, housing the Irish America Hall of Fame (in conjunction with Irish America magazine) was opened alongside the Dunbrody and the ship was refurbished. And this year, on July 4, the town of New Ross will host the first ever Irish America Day with a series of events to celebrate the longstanding relationship between Ireland and America. To accommodate the increased tourist trade to the area, the New Ross Town Council, with support from Fáilte Ireland, is building a new civic plaza and riverside boardwalk linking the Dunbrody with the John F. Kennedy statue, on the far end of the quay. This will allow visitors to walk from one tourist attraction to another, along the same quays where sailing ships berthed before transporting emigrés to all corners of the world. A podium placed near the JFK statue will hold an audio component that allows visitors to hear the speech he made on the spot in 1963. “Linking the Kennedy statue to the Dunbrody is symbolically important,” explains Sean Reidy, CEO of the John F. Kennedy Trust and manager of the Dunbrody visitor center. Sean has been with the Trust since 1991, when he answered an advertisement for a project manager to develop a “heritage centre.” On accepting the job, he learned from then chairman Paddy Quinn that he would have to raise the money to cover his salary. Undaunted, he approached the task with confidence and a personal belief that a reconstructed emigrant ship in the port would make a dramatic visual statement and attract tourism. Paddy and others saw the potential in Sean’s idea and the project attracted financial support from a variety of sources including the National Tourism Develop-ment Authority, Fáilte Ireland, and the local community. Paddy went one step further. While the ship was still under construction, he phoned Sean with the news that he had just bought the Five Counties Hotel. “We’re going to need a great hotel for the thousands of people who are going to come to see the Dunbrody,” he said. The hotel, rebranded as the Brandon House Hotel, sits high on a hill close to the town. It was completely refurbished by Paddy and his wife, Patricia who added more than 40 bedrooms, bringing the total to 78. The pièce de résistance of the makeover is the multi-million-euro state-of-the-art spa called the Solas Croí (Irish for “light of the heart”), which attracts visitors from all over Ireland. These visitors, in turn, stop by the Dunbrody, which they pass entering and leaving the town. The ship also draws visitors from the UK and Europe. 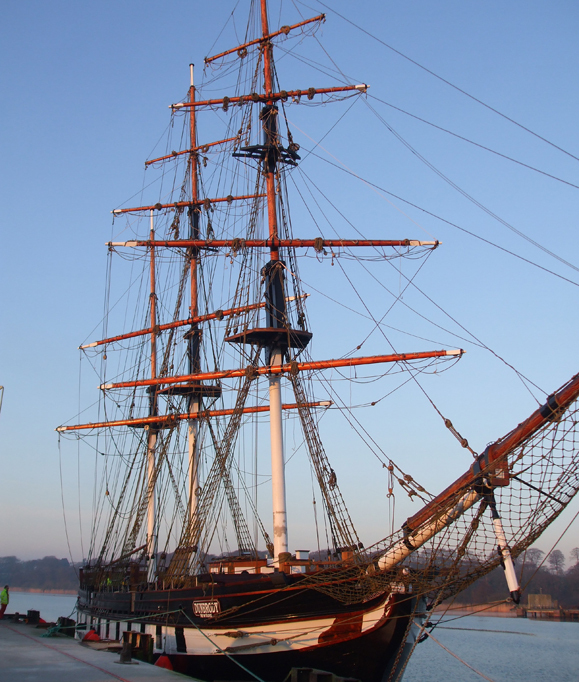 In fact, the Dunbrody is one of the first tourist attractions for European coach trips coming through Rosslare. Add to that, a full twenty-five percent of the visitors that are from the U.S. Paddy died just two weeks before the official launch of the new Dunbrody Visitor Centre in July, 2011, but, it’s a consolation to Sean, with whom he shared an enormous bond of friendship and trust, that he lived long enough to see that the John F. Kennedy Trust achieved what it set out to do. “If you look back at 1991, and you were to say, you’re going to have a replica famine ship, an emigration history center, the Irish America Hall of Fame, a new quayside about to be developed, investment expected in the Kennedy Homestead, you would say we have achieved everything we could have possibly hoped to achieve,” says Sean. But he and his fellow New Rossers are not ones to sit on their laurels. “We now have 60,000 visitors a year to see the ship. The goal is to increase that figure to 100,000,” he says. Sean is especially proud of the association with Irish America magazine on the Hall of Fame. “It is particularly appropriate that we should have a national center in New Ross honoring the achievements of Irish emigrants and their descendants, and that it be on the same quayside from which JFK’s great-grandfather Patrick boarded the emigrant ship bound for America. What a remarkable journey from famine emigrant to President of the United States in just three generations,” he says. The planned Irish America Day, is a further celebration of the enduring ties between America and Ireland. “This inaugural event in a national celebration of our joint heritage that stretches back to the very founding of the United States,” says Sean, who conceived the idea. Among the many colorful events on that day, will be the induction into the Irish America Hall of Fame of some of the greatest Irish Americans of yesteryear – people who left an indelible mark on the American nation, such as Charles Carroll, signatory to the Declaration of Independence; John Barry, the father of the U.S. Navy; Thomas Francis Meagher, Civil War hero; Eugene O’Neill, literary genius; James Hoban, the architect who designed the White House; Mary (Mother) Jones, labor leader; James Concannon of the Aran Islands who established the Concannon Winery in California in 1883; George M. Cohan, composer; and John Huston, movie director. The July 4th celebrations will end with a gala concert featuring the Three Tenors Ireland in concert at the JFK Arboretum. Paddy Quinn would agree. He wrote a poem shortly before he passed away that now has pride of place in the Irish America Hall of Fame. From their poverty and strife. From their loved ones left behind broken hearted on the quay. But all were willing to take the chance. When John F. Kennedy visited New Ross in 1963, a major effort was made by the Harbour Commissioners to ascertain what exactly had transpired when a Patrick Kennedy left the town by boat in November 1848. Discounting the possibility that this Patrick may not have been in fact the Kennedy ancestor, they established that in November 1848 Patrick had embarked on the ‘Dunbrody’ to Liverpool. There he remained until he began his fateful journey to Boston on the ship the ‘Washington Irving’, arriving on American soil at the end of April 1849. The facts were made known to the President during his visit, and he discussed them informally with members of the Harbor Board during their time together on the town’s quayside.